Sell your handmade teddy bears. Made by teddy bear artist around the world. Sell your handmade teddy bears. Made by teddy bear artist around the world. How do fees work on ubear? Joining and setting up a shop on übear is FREE. Listing on ubear is FREE and listings last until the item is sold or deleted. Once a sale occurs, we take a 10% transaction fee on the item’s sale price not including the shipping costs. Fees for transactions are processed instantly through Paypal’s Adaptive Payments. Sellers must have a Paypal account to sell on our site. What can I sell on ubear? ubear provides a marketplace for teddy bear artists and collectors to sell their handmade creations, vintage goods and both handmade and non-handmade crafting supplies. Setup your store for free! Hi this is big ears could you tell me anything about him. He has got wear and tear to his front where I’ve taped him up. I have a beautiful Koala. From previous comments it looks like he is rare. Real fur, glass eyes and leather nose and claws. I think he is circa 1940’s? Did they make them jointed this late or is he earlier? He is a wee bit grubby, but fur is in good condition for age. Slightly bald down back seam and his left leg. Ear also thinning. Leather claws are intact. Leather nose good but faded. How much is this bear worth? Susan, your koala appears to be one produced by several competitors to those of my family business of J.Jackson and Son here in Brisbane. Ours were first produced as Billy Bluegum in 1925 with major changes with our patents from about 1930. These included rubber nose and moulded rubber claws just like the real animal, Also moveable arms and legs, Thousands were sold out of Brisbane and other stores, even during World War 11. We stopped making about 1953. I’ve a full history with illustrations if you are interested. 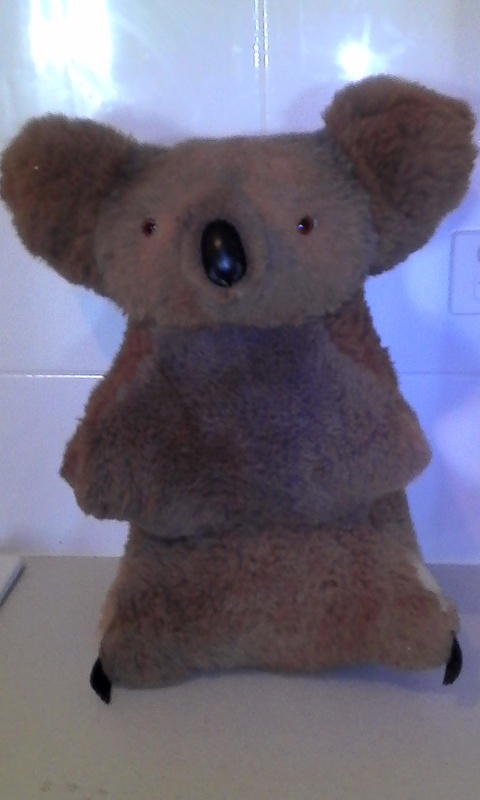 My cousin has her koala from 1930 when she was used in an advertisement. But I’m in the market for any genuine version subsequently.